Mesh upper front and back provide air flow. Pockets: Front: Large Radio/Cell Phone, Split Pencil/Tablet, 2 EA Full, wide deep pouch pocket,. Silver 2" Class 2 Reflective Tape. From Acudavid of Santa Monica, California on 11/27/2017 . From Peter MCcartney of McKinney, Texas on 8/29/2017 . I am very happy with my vest. 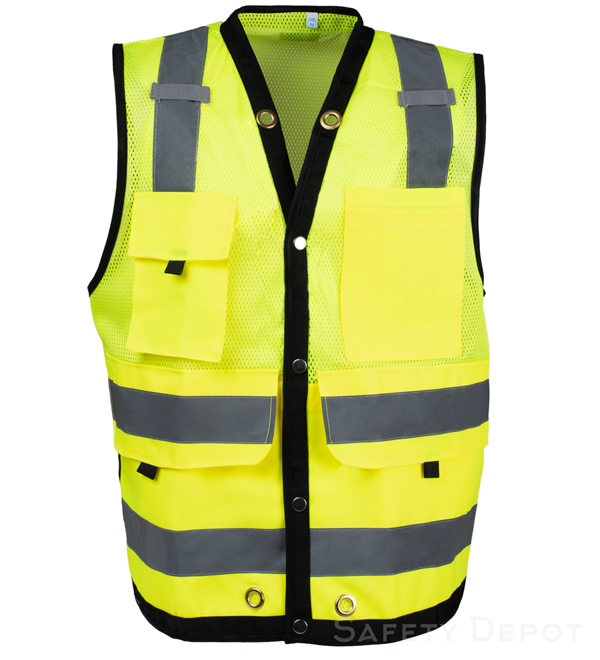 I do school crossing and citizen on patrol work and this vest is just what I was looking for. I am looking forward to purchasing more products in the near future. From Jeff of Fayetteville, Georgia on 1/10/2016 . Good vest but the front right cell phone pocket is too shallow and the flap does not secure over the larger phones.